Here are all the fault lines that I could think of. What am I missing? Where do your preferences lie? This is the probably the fault line that I have the strongest opinion on. I am in favor. An elf class is very different from a fighter class, but an elf fighter is very similar to a human fighter. Most of the specialness of demihumans bleeds away quickly, and race choice just ends up being another lever to use in maximizing your move silently check (or whatever). Also, not having race separately means one fewer choice at chargen time. This was the issue that prompted this post, but I have no dog in this fight. I’m fine with the classic mace-wielding D&D cleric, and, as James M. notes, coming up with justifications for this restriction can be fun. There is a compromise solution where clerics are limited to weapons that are appropriate for their particular god or religion (did this start in AD&D, or 2E, or somewhere else?). I’m not a big fan of this approach, though I often played with it, because everyone wants to play a cleric of the thunder god (or whatever god allows the best weapon selection). If edged weapons are allowed, the cleric also works well as a holy knight class, obviating the need for a paladin to fill that archetypal niche. I’m much more interested in the cleric being seen as a demon-hunter rather than a parish priest that for some reason ventures into dungeons in search of treasure. I do like the idea of no weapon or armor restrictions at all, and if I opened up cleric weapon selection, I would probably go this route. I also like FrDave’s solution (in a comment on that Grognardia post) to break weapons into categories and allow fighters access to all of them, but clerics only access to one (chosen at character creation time). I’ve never played a game where these were actually a limiting factor. I am in favor though. I prefer a more human-centric campaign. My experience in 2E and later editions is that adventuring parties end up being mostly made up of elves, with humans being a clear minority. This breaks the sense of the fantastic that I think should be associated with demihumans (though maybe that is an argument for them not to be playable PC races to begin with). I also like the idea of characters retiring and the setting persisting. A level limit serves as a nice reason to move on to another character. In the past, I was very anti-alignment. It seemed to be a vast oversimplification, and I was a moral-relativist teenager when I started playing. Were not most people, even the villains, good from their own perspective? This is, of course, a popular trend in modern art and philosophy. Antiheroes are still tremendously popular (for example: Batman, Elric, Dexter). Alignment also seemed to get in the way of characterization, which at that time seemed like the holy grail of role-playing. I would probably still have trouble playing with a by-the-book alignment matrix, though re-conceptualizing alignment as arcane and non-arcane is interesting (as in LotFP, where working magic is inherently “chaotic”). This (Blood of Prokopius: Conan and Alignment) is the best post I have read in a while about alignment. 3d6 in order. I still have a fondness for 4d6, drop the lowest die, arrange to taste. This is the way I played through most of the 90s, and it injects some randomness while allowing you to play a reasonably competent character of any class. Any method that takes longer is flawed because I value streamlined character creation. Point buy systems (especially non-linear ones) require too much time and calculation, and encourage numerical min-maxing. I’m still on the fence here. They have never come up in games I have played in, either as referee or player. I’m not sure how I would react in practice, so I would like to try it out at some point. Logically, if one is okay with save-or-die traps, I think one should also be okay with level drain attacks. They are one of the few things that truly induce visceral fear in players, and that is nothing to sneeze at. This entry was posted in Uncategorized on November 8, 2011 by Necropraxis. I pretty much agree with you on all points. For ability scores, I do 3d6 in order but allow the players to swap any two of the first four (Str, Int, Wis, Dex) because it makes them happy. What can I say? I’m just a big softy. Level drain? As a player, I always HATED that. My favourite PC, the thief Harmel, never made it beyond 5th level because he kept meeting wraiths and spectres and getting drained back down to 2nd or 3rd. Aargh! So frustrating. Needless to say, as a DM, I love it. I can largely agree with your pints. Especially Race-as-Class give demihumans a lot of unique flavor. As for random Ability scores, I generally only use them for older editions were they only really factor in if you have extreme results. From 3e onward, Ability modifiers have become a lot more important and frequent. A character with low scores can become pretty useless (especially casters, who can end up not being able to cast if they’re unlucky), whereas one with very high scores can become a show stealer. @Doresh I think the aspect of the rules that really cemented the importance of ability scores was the requirement for certain scores to be able to play various classes. The character bonus optimization trend that reached its peak in 3E was, I think, the culmination of something that started much earlier. And how could I have forgotten the mother of all fault lines, ascending or descending AC? In my defence, I skipped the 3E years, so ascending AC was not a “thing” when I was playing in the 90s (though I gather many people house-ruled ascending AC into their games even in the 70s). I never had much issue with THAC0 or descending AC, so to some extent I see ascending AC as a solution in search of a problem. I don’t really dislike ascending AC, though I dislike one aspect of the abstraction that it represents: the fact that AC can go arbitrarily high promotes stat inflation, as opposed to the original idea of AC to armor being a 1 to 1 relationship (that is, you can determine what armor is being worn by knowing the AC). It is true that descending AC has the same problem when you take it into negative territory, though I think there was a hard cap (bottom?) 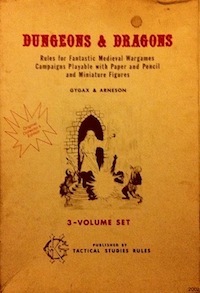 at -10 in AD&D and 2E. @ClawCarver Interestingly, I think opinions about a number of these issues may commonly split between those who usually referee and those who usually run PCs. I’m not sure what this says about the cooperative or oppositional nature of this hobby, but that might be worth another post at some point.